Atlanta, July 20, 2016: The leading OTT player in South Asian content, YuppTV has made its mighty comeback on the Roku® platform in the USA & Canada, introducing its extensively updated video content, packaged in a superior and advanced user interface. 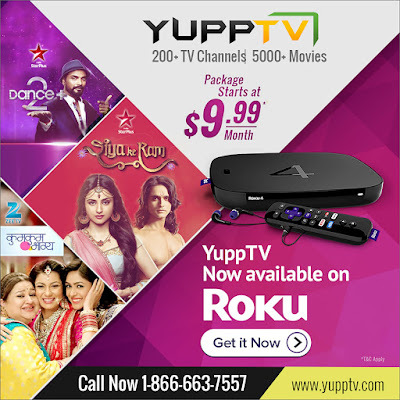 In 2010, YuppTV has been the first Live TV channel on the Roku platform, which includes the Roku Streaming Stick®, Roku Streaming players and Roku TV™, providing Indian expat community, easy access to high quality South Asian entertainment content. Post 2012, the channel continued to provide the content to other markets, except USA & Canada. Roku users in USA & Canada will now be able to access YuppTV’s 200+ LIVE TV channels, Catch-up TV and YuppFlix, the largest Bollywood and South Asian regional language movie catalogue, with more than 5,000 titles. Further enhancing the content offering, the app will also offer online movie premiers mostly within three weeks of the release in YuppTV’s Pay per View movies. “It is inspiring the way YuppTV has evolved its service offering over the years and we’re excited to be able to once again offer Roku consumers in the U.S. and Canada an amazing selection of premium South Asian content,” said Ziba Kaboli-Gerbrands, director of content acquisition, Roku, Inc. In succession to the launch, YuppTV has also added new languages in its offering, now allowing more Roku users to enjoy video content in Sinhala, Urdu, Nepali and Bangla. YuppTV will also offer nine popular channels from Argentina like TYC Sports, El Trece, America Sports available for Argentine expats living in USA & Canada. With the newly updated user interface, the channel offers an aesthetically enriching experience. Furthermore, the next update of the channel will also feature YuppTV Bazaar, the online marketplace for video content, and Yupp News, which curates the top news from around the world in short video snippets. YuppTV has 25,000 hours of entertainment content catalogued in its library, while nearly 2,500 hours of new on-demand content is added to the YuppTV platform every day. YuppTV offers Live TV and Catch-Up TV technology. YuppTV has its presence in more than 50 countries. It has recently launched YuppFlix, a movie on demand streaming service for Expat Market and YuppTV Bazaar an online marketplace for the premium content curator. YuppTV is currently ranked #1 Internet Pay TV platform for Indians living abroad and also the largest Internet TV platform from premium content availability in India. YuppTV is the most downloaded Indian SmartTV app and it also boasts of 8 million mobile downloads with 4.0 user rating.